The aim of a loyalty program is to increase customer retention and to retrieve relevant customer data. You can reward your loyal customer with free products, discounts, or gift vouchers when his loyalty balance has reached a certain level. Hiboutik has designed a complete and easy to set up points based system to manage your loyalty program. In a word: your customers earn points with every purchase they make, and they can redeem their loyalty with free items or any other advantages (gift vouchers, discounts…). – and Set up points of the loyalty program. – and a quantity of points deducted when the product is rewarded. With the same process used to update prices, you can set up you loyalty points in bulk with a spreadsheet file. Ex: If we want to reward our customers with a 10% discount, we will apply a rule that gives 10 points per each dollar spent. So the purchase of a 50$ product will give 500 points, and 5000 points are needed to reward it for free (=number of points earned/loyalty discount). Loyalty points will be earned on all sales assigned to a customer. You customer will only earn the loyalty when the sale has been closed. When a product is returned, the loyalty points associated with that item will be removed from your customer’s loyalty account. If you update the points earned for an item, it will not modify the points earned for this item on sales closed before the update. The loyalty balance of your customer is available in your customer form, or is displayed next to the name of your customer when he is assigned to a sale. – add an initial balance of points to your customer (ex: recovering your customers’ loyalty accounts when migrating from another system). 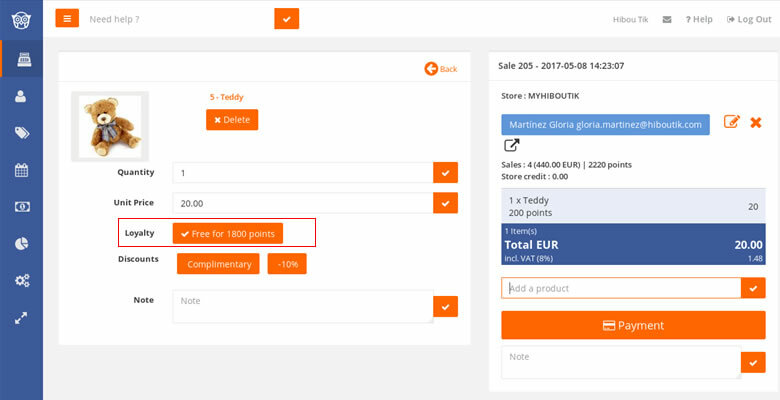 Your customer can redeem loyalty when his loyalty balance has enough points to get one product for free (points fulfilled in the product form). In a new sale, add the products purchased by your customer, and select the product you want to reward. In the left side of the sale, you will find for the product a “free for x points” button. If you click on it, the price of the product is turned to 0, and points are deducted from you customer loyalty balance when you close the sale. Products paid with loyalty will not earn any loyalty. The loyalty reward is a gift voucher of x (in value or %) when your customer reaches a loyalty balance of y points. For this kind of loyalty program, you don’t need to fulfill the “free for x points” field in each product form. 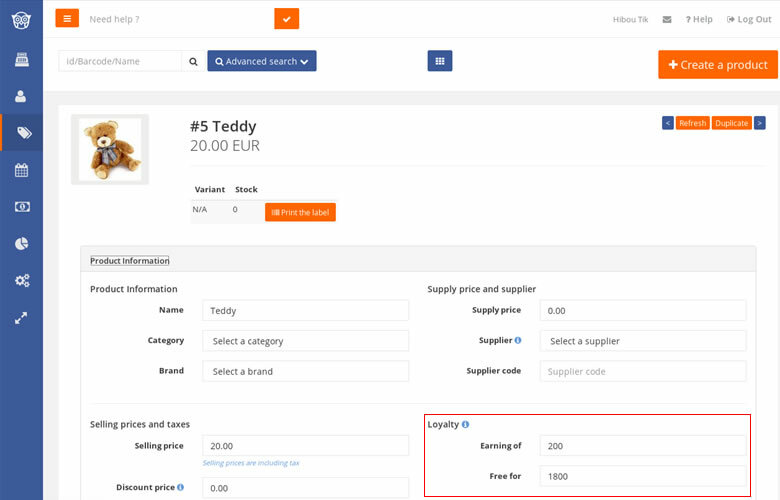 You just have to create a “loyalty gift voucher” product, with a selling price at 0. This product gives no point when is added to a sale, but costs y points if you reward loyalty. – you select the “loyalty gift voucher” product, and you click on the button “Free for y points” in the left side of your sale (y points are deducted from your customer loyalty account). – Finally, you apply a discount of x (in value or %) to the sale with discount buttons. And you close the sale. Note n°1: Points are integers, so we advise you to apply a ratio of 10 or 100 when you set up your loyalty points rule, to take into account your decimal prices. ex: if your customer gains 1 point for each dollar spent, a 50 cts product will reward no point. But if you customer gets 10 points for each dollar spent, your 50 cts product will add 5 points to his loyalty account. 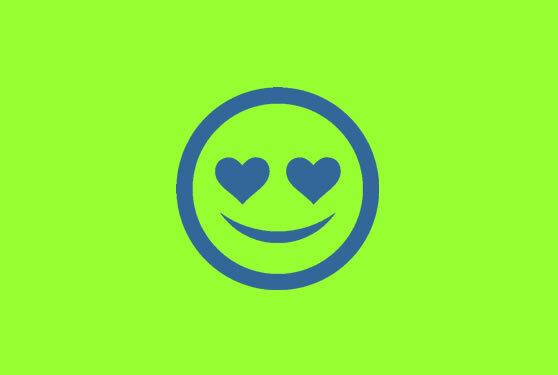 Note n°2: You can set an initial balance of loyalty points to your customers, for example if your transfer into your account an existing loyalty program from another solution. Go to your customer form, and modify information (“Initial balance of loyalty points” field). 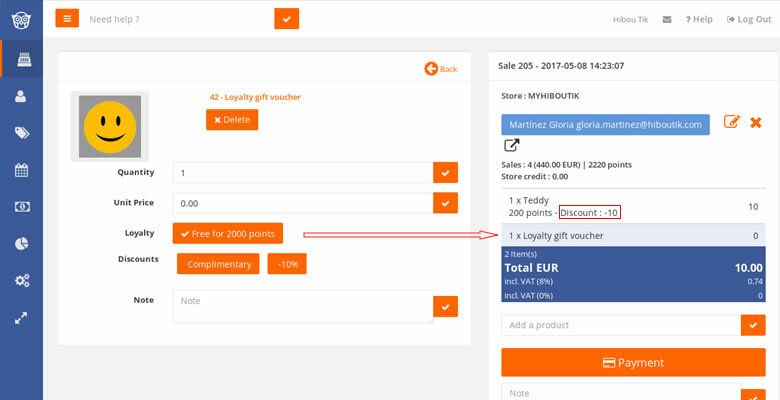 Note n°3: You can modify loyalty points earned on a sale by activating the right in “Settings/Users/Access Management”: “Modify loyalty points earned by a customer on his sales history”. Go to your customer form, in the “Products” section to update loyalty points earned. The free Hiboutik POS software is the easiest solution to reward your loyal customers!